The ensemble presents music of many styles and backgrounds from traditional to modern, folk to classical, special programs for special occasions using authentic instruments and costumes. "The great success of the 'Russian Carnival' Ensemble can be explained by top level professionalism, unity of the ensemble, and the musician's ability to fully fuse with the music they perform." The Russian Carnival Ensemble was formed in 1998 by a famous duo: Tamara Volskaya and Anatoly Trofimov. The ensemble brings a new dimension to the use of traditional Russian folk instruments presenting music of different styles through the prism of natural sound of unique instruments. The group includes artists originally from Ukraine and Russia whose combined musical experience demonstrates mastery both of their instruments and the music they present. The group, which can consist of two to six performers (including singers), is available to perform for festivals and other venues all over the country. The ensemble provides "the Russian flavor" for events large or small whether as the centerpiece of a gala performance or as background music. Soon after the "Russian Carnival" Ensemble was established, the group became a prominent feature of New York City's musical scene and of Brooklyn community life. The ensemble has performed at Trinity and Saint-Peter's Churches, Merkin Hall, and the 92nd street "Y" in New York City. In 2000, they were featured at the Hillwood Museum in Washington D.C. and at a ceremony hosted by Her Majesty Queen Rania Al-Abdullah of Jordan in New York. Highlights of 2001 were performances for the prestigious Madison Council of the Library of Congress, various festivals, and being featured nationwide on the CBS prime time special "Christmas Around the World." In 2002, the ensemble participated in the "Russian Winter Fest" in Brooklyn, performed for the Russian Ambassador to America, and was featured at the Slavic Festivals at Montclair and Kean Universities, Washington D.C. and in Manhattan. The ensemble presented two programs "A Musical Journey around the World" and "From Baroque to Folk" at the Fortunoff Hall of Dawling College. Highlight of 2004 was the "Russian Carnival" Ensemble performance at Avery Fisher Hall as part of the "Russian Splendor" program. February 2006 was marked with a tremendously successful performance of the ensemble at the Weill Recital Hall of Carnegie Concert Hall. The ensemble's most recent achievement was a concert-lecture at the British Museum of Yale University. The ensemble recorded two programs. In 2003 they produced a new CD consisting of the highlights of ensemble's repertoire. Soloists of the ensemble Tamara Volskaya(domra) and her husband Anatoly Trofimov(bayan) make up one of the most electrifying duos to be found in the world. Irina Zagornova is widely recognized as one of the brightest artists in the field of village folk singing. Musicians of the "Russian Carnival" possess equally exceptional skill in playing the instruments of the mandolin ensemble as well. Their magical conversion from domras and balalaikas to mandolin, mandola and guitars brought to life the mandolin group "Rondo" in 1999. 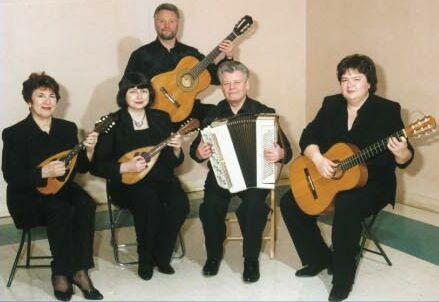 "Rondo" mandolin ensemble comprises of Tamara Volskaya (mandolin), Mayya Kalikhman (mandolin and mandola), Nataliya Vsevolodskaya (guitar), Leonid Bruk (bass-guitar) and Anatoly Trofimov(bayan). As a result of the ensemble’s immense efforts, two new programs, "Musical Journey to Russia and Italy" and "From Baroque to Folk" were born. These concerts illustrated a deep connection between the two instruments from the lute family - mandolin and domra. In 2007-2008 "The Russian Carnival" participated in numerous festivals, had broadcasted performance at famous Trinity Church in Downtown Manhattan and recently performed at the Russian Mission of United Nations in New York City. The ensemble announced 2008-2009 as a celebration of the 10th anniversary of the group! They are going to mark the jubilee with a program consisting of the highlights of their repertoire. The program also will include new arrangements of popular Russian, Jewish, Ukrainian, and American tunes as well as classical music. 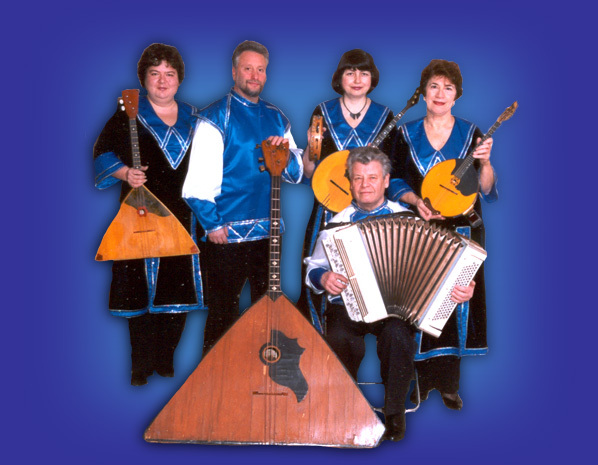 The group consists of extraordinary professional musicians who contribute to the growing interest in Russian folk music and instruments in America. Tamara Volskaya and her husband, bayanist Anatoly Trofimov are "Honored Artists of Russia", winners of international and national competitions, and professors of the Mussorgsky Ural State Conservatory. They have toured throughout Russia, Europe, Canada, Australia, Japan, and the United States and recorded numerous remarkable CDs. Mayya Kalikhman -- a true multi-instrumentalist is equally skilled in playing the second-domra, alto-domra, and some percussion instruments in the ensemble. Nataliya Vsevolodskaya combines professional and deeply sensitive performance on the guitar with inspiring playing on alto-balalaika as well as on percussion instruments. Leonid Bruk has brought a lively musicality to the bass section of the ensemble and performs on the balalaika-contrabass with phenomenal artistry.